Photos from www.pixelio.de, by various photographers. Thanks! If you're in Dublin, and somehow want to take some time off from pub visits (it's tough, I know, but fitness needs its moments, too), then here's a nice, short running route that takes you past a lot of the most pleasant parts of town. 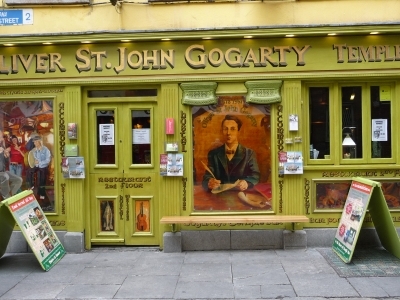 We'll begin in Dublin's evening fun district, Temple Bar, and run a loop through the nicest Georgian-era and other old heritage buildings in the town center. And if we're starting in Temple Bar, let's do it right, and start right there on the banks of the River Liffey, at the Ha'penny Bridge. 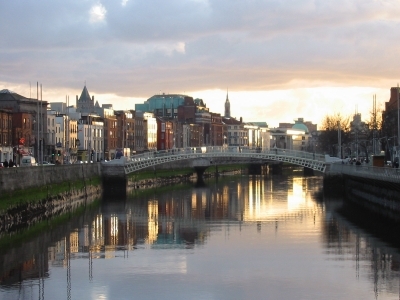 This graceful old footbridge provides the perfect backdrop to head off through Dublin's historic center. Turning your back to the bridge, run straight ahead, eastwards, through the arched gateway into the alleyway. In just a block, you run into Temple Bar Street. Take a look to the right and straight ahead: this is where you have to come back when you finish the run, and then spend this evening in Dublin's main collection of pubs and restaurants. We'll turn left now, though, and run north for a block until you see the yellow Oliver St. John Gogarty's pub, where you'll find some traditional Irish music (they call it "trad" music here) most evenings. Turn right on Anglesea Street and head south past more pubs. In 2 blocks, the street ends at Dame Street, where we turn left and run towards Trinity College campus, which you'll see straight ahead, 2 blocks down. Just before you get there, you'll see the elegant old Bank of Ireland building on your left side. The Irish must have a split personality when it comes to this heritage, though. For, if a building is old and large in Ireland, it was built by the English. So preserving the grand old buildings means keeping alive this dark time of their history. Cross busy College Street, and you'll run right into the front entrance to the college, a wooden door through a massive classical facade. The Trinity College campus is open to the public, and you can run straight through and out the back way. Just run through the first grassy courtyard, towards the tower of the chapel, then keep towards the right side, running past the old library (home to Ireland's great cultural treasure, the Book of Kells). After the second courtyard, you'll come to a bigger open area, with the rugby grounds on the left and a larger cricket oval on the right. At the end of the open area, turn right and continue with the cricket oval on your right side. At the cricket clubhouse, turn left and run the last 100 meters to the back exit at Lincoln Place. Turn left when you leave the campus, and run the one block to Merrion Street, where you turn right and run one more block to Merrion Square, Dublin's most beautiful Georgian-era square. The houses bordering all 4 sides are elegant, and the park itself is worth running through. NOTE: This is IF you get there in the daytime. 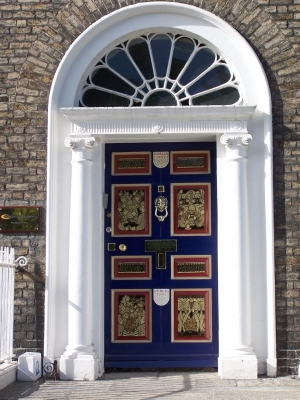 Merrion, like St. Stephen's Green and Dublin Castle are all closed evenings and early mornings. If you first run straight, with the square on your left, you'll pass the National Gallery and History Museum on the right, behind the courtyard with the obelisk. Across from the obelisk, run into the park at the little pyramid (if open. Otherwise, continue running counter-clockwise around the square). When you get to Merrion Square East, keep going east on Upper Mount Street, running straight towards a church, St. Stephen's, set in the middle of the street. Just a block behind the church you will come to the 200-year-old Grand Canal. Turn right and run along the canal bank, going past the old wooden boat locks and stone bridges. 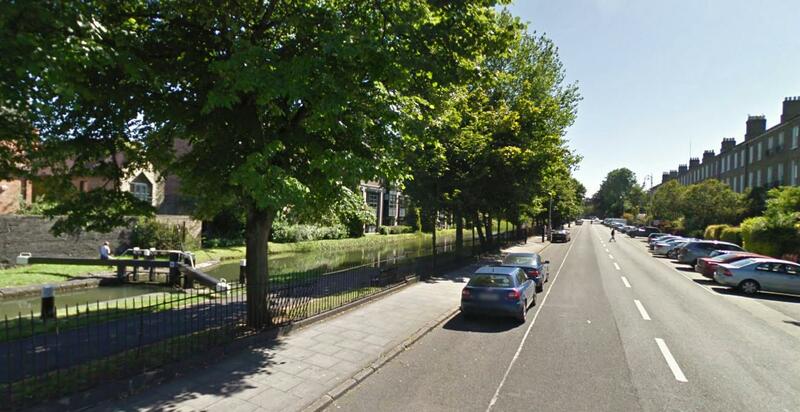 Keep running along the canal until you get to the second bridge, at Leeson Street. Cross Leeson diagonally to the right and run up Adelaide (with the little brick building in the intersection to your right). Run 3 blocks and then turn right on Earlsfort Terrace. You run past the National Concert Hall and run straight to Dublin's biggest square, St. Stephen's Green. If the square is open, run diagonally through the park. (Otherwise, run counter-clockwise outside it until you come to the opposite diagonal corner.) When you're in the middle of the park, before the lake, circle around to the left side to come out at the big stone archway at the other corner of the square, opposite Grafton Street. This is Dublin's big pedestrian shopping street. NOTE: Grafton is the street in the great movie "Once" where the musicians were busking and the girl was selling her flowers. Run straight down Grafton, heading back towards Temple Bar. When you get to the end of the pedestrian street, with Trinity College directly ahead, turn left on the small pedestrian sidestreet, Suffolk Street, which will curve to the right and bring you back to Dame Street, with the Temple Bar neighborhood straight ahead. Turn left and run down Dame Street until Crow Street, where you turn right and run past all the pubs and clubs, doing a right/left zig-zag on Cecelia, and you'll find yourself right back at the Liffey, near the Ha'penny Bridge again. NOTE: If you still feel like running and seeing more, and it's daytime, you could keep going down Dame and run the 2 blocks to City Hall, and turn left just past the building to go do a loop inside Dublin Castle, a collection of buildings going back to the year 1200, but, as I mentioned, it's closed mornings and evenings.